A little more than half of the 2,000-plus students who participated in Aviation Day on April 9 had never flown in an airplane before. Needless to say, far more had never considered working in the airline industry – at least not until they heard from a team of experts from Southwest Airlines. Sponsored by CFES Brilliant Pathways and Southwest Airlines, Aviation Day exposed students to the growing number of good paying jobs in the airline industry. Southwest Airlines’ Campus Reach Program engages future Southwest employees to inspire an interest in an aviation career. 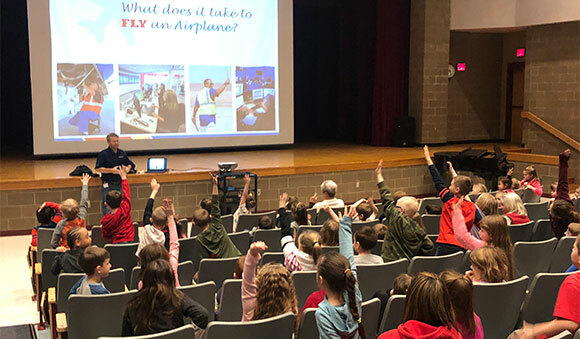 Four Southwest employees facilitated aviation lessons and activities with elementary and middle school students in Ticonderoga, Beekmantown, Crown Point, Malone, Moriah, Willsboro and Ausable Valley. Middle school students engaged in teamwork exercises and leadership lessons based on the experiences of a woman who overcame obstacles to gain her pilot’s license. They were also taken through a branding lesson that involved them creating their own personal brand statement. Elementary school students played aviation charades and participated in paper airplane making contests. Students learned about the wide range of jobs in the airline industry including administrative support; flight attendant; pilot; operations agent; security officer, air traffic controller; maintenance technician; aircraft mechanic; sales representative; facilities technician; reservations clerk; and inspector. Many were surprised to hear about the benefits offered by Southwest including college tuition reimbursement, health and dental insurance and a 401K that Southwest matches dollar-for-dollar contribution an employee’s eligible salary between 8.3 and 9.3 percent.